We celebrated Elise's birthday with simple touches of color. 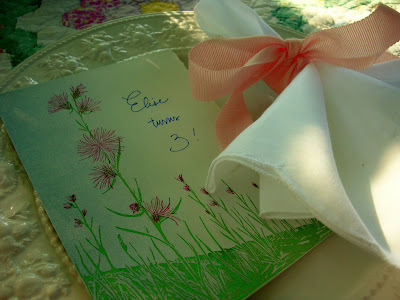 Above, grosgrain ribbon tied around old napkins and yard sale notes made into little menu cards. Meredith - this looks simply gorgeous. Perfect for a sweet BIRTHDAY GIRL! How can Elise be 3 already? Wow! It looks like it was a beautiful celebration! I'm just curious what you got for Elise for her birthday. Any special, big gifts? I can't believe she's three, either. I remember you posting when you went into labor and taking a picture of your bags on your old patio...unbelieveable that all that was three years ago! The cards you made look beautiful. Happy Birthday to a lovely little girl! This looks so sweet. Happy birthday, precious girl! 3 already? i swear she was just a baby when i began reading your blog! perhaps not, but they grow too quickly! Found your blog through another blog and have been reading it. I thoroughly enjoy it! My daughter Elise turned 3 today also!!! Happy Birthday Elise! I hope you will share more birthday pictures with us. I love birthday celebrations: the cake, the presents, the decorations, the fun! I hope it was a great party and looking forward to seeing more! The perfect birthday creation for a sweet little baby big girl! "Pretty Cute" is your signature! Very elegant! Happy birthday to your pretty little girl! I like your title, "use what you have." :) The cake looked yummy (your remark about Pepperidge Farm cakes was very funny). Beautiful! If this is "use what you have" I can't imagine what you would do with "spend all you can"!